Six years in the making, the TruGrade standards were developed to address the common-most frustration when working with real wood veneers — the visual inconsistencies typical in both architectural and acoustical wood panels. Concise definitions of character marks, grain structure, leaf matching and figure types. A color scale to determine overall veneer color and variations of color within the veneer. A cumulative numeric grading scale based on 100 points, with negative values assigned to objectionable characteristics. As you can see from the diagram on the left, the current standards leave too much latitude in character definition, while not addressing some characteristics at all. This can result in "B" grade panel that look better than "AA" grade. The TruGrade veneer standards contain the tools to allow us to provide exactly what you want, resulting in both time and money savings. TruGrade offers an unprecedented level of granular control over the selection of visual characteristics in acoustic ceiling and wall veneer panels. As a designer, you’re aware of the difficulty in controlling the appearance of wood veneers within a project. Costly options such as hand selecting specific veneer samples give you a small view of what the final product will look like. Additionally, the final appearance can vary significantly depending on how the veneer is optimized and laid up by the acoustic panel manufacturer. The new TruGrade veneer standards give you maximum control over every visual characteristic. Since the look you want is quantified, you can be confident that your expectations can be maintained throughout a project, and between multiple projects. Millwork projects often require the most critical veneer applications. A complete understanding of a veneer's appearance is not just convenient, it’s essential. When leadtimes are measured in hours not days, you can’t afford to be surprised with veneer characteristics that other grading systems don’t address. Using the TruGrade veneer standards ensures that everyone, from the architect, the millworker, the installer and the client have the same expectations of the veneer’s appearance. Not only do your fixtures have to look consistent, they have to look consistent from store to store, year in, year out. Unfortunately, veneer panels can be anything but consistent. The new TruGrade veneer standards, however, organize veneer based on color, grain structure, figure and a number of other characteristics. Since you can isolate the characteristics that are important to you, you won’t pay for a grade you don’t need. You will notice additional savings in time and energy by not having to sort panels for uniformity. From the beginning of a project you’re aware of how imperative it is that your customer under-stands the variables contained in wood. The TruGrade™ veneer standards contain the most comprehensive collection of characteristics ever published, allowing you to immediately establish the appearance your customer desires. 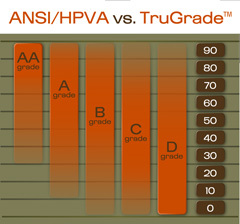 Going well beyond meeting their expectations, the TruGrade™ veneer stand- ards can help establish you as an authority on veneer, offering them options that have never been defined before. It’s usually difficult to demonstrate a grade of plywood that you’re selling is better than your competitor’s, especially when they’re calling it the same grade. It’s even harder knowing if the grade of plywood you have is what your customer wants. 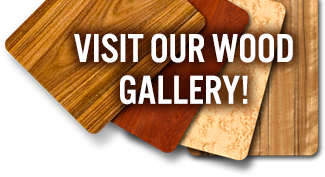 Using the TruGrade™ veneer standards, selling plywood becomes almost as easy as selling laminate. You can be assured that every sheet in a unit meets the exact grade you’re buying. And talk about options! Instead of 2 or 3 face grades, you can order 6 or 7, and have them sorted for color, figure ... even grain structure! Imagine telling your most difficult customer that you can precisely dial in the look they need and deliver it every time. When they pressure you for price “adjustments”, instead of selling them a lower grade that is drasti-cally different, you can offer them a variety of options. These options will give them the peace of mind that they are buying from the right supplier.